The broadest measure of inflation showed no change in April, the Bureau of Labor Statistics said. A dip in gasoline prices helped keep the Consumer Price Index from rising and led to a 2.3% annual inflation rate, the lowest in 14 months. The less volatile core index, which takes out fuel and food costs, also had a 12-month rate of 2.3%, which is below the 30-year average rate of 3.1%. A key measure of consumer spending – retail sales – rose slightly in April after a stronger gain in March. The Commerce Department reported nine of 13 categories with greater sales in April, led by automotive. Year-to-year retail sales grew by 6.4%, the lowest rate since August 2010. The 20-year average rate is 4.5%. Businesses added less to their inventories in March than analysts had expected, but Commerce Department figures showed stockpiles keeping pace with demand as the inventories-to-sales ratio remained near historic lows. That suggests extended caution by business executives but positions them to respond quickly to changes in demand. The beleaguered housing sector had an encouraging sign with housing starts rising more than forecast in April. The annual pace of new construction increased nearly 3% from March and was up 30% from April 2011, according to a joint report from Commerce and the Department of Housing and Urban Development. While the development is positive, the pace for housing starts is only about two-thirds what it was before the recession and less than half the average since 1959. 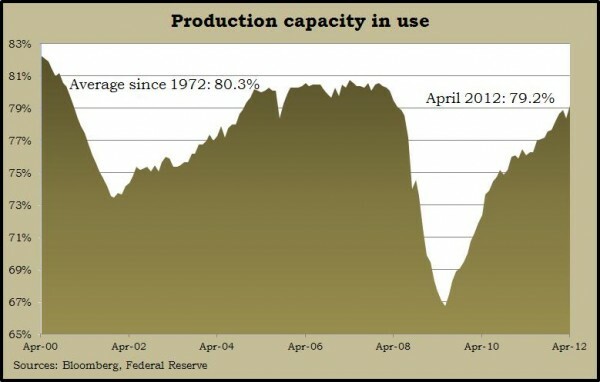 The Federal Reserve reported better-than-expected industrial production and capacity usage in April. Boosted by a rebound in utilities after a mild winter, industrial production rose at the fastest pace in 16 months. Industries overall were operating at their highest capacity in four years. Both indicators suggest continued moderate expansion of the economy. The moving four-week average for initial unemployment claims declined for the second week in a row, signaling more gradual progress for the longsuffering labor market. Labor Department data showed jobless claims down 14% from the year before, the widest such gap since August. New claims below 400,000 a week suggest employers overall are adding more jobs than they’re cutting. The level has been below that number for 29 weeks in a row.